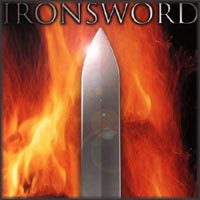 Ironsword is a simple but powerful name that conjures up images of epic battles. The artwork is equally so in its aesthetics. Do you think it was an appropriate choice for the band’s image and the music portrayed within? I honestly think that the music is much more important than a band’s image although that is also relevant. But I often get disappointed with unknown bands that portray a good image but the music is mediocre so it totally misleads your judgement. 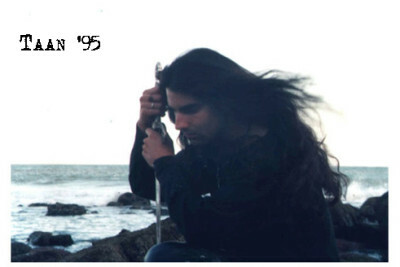 The so-called Power Metal scene has become a parody of itself with all the bands taking photos with swords and dressed with medieval like clothes. The mysticism is gone. 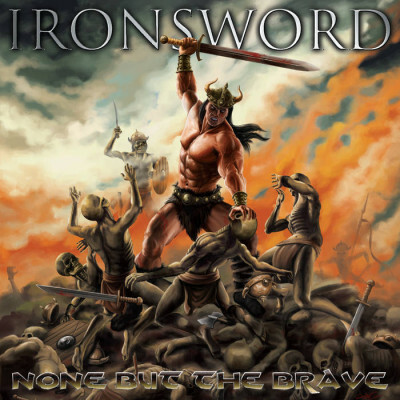 Anyway, everything in Ironsword, band name, music, lyrics, artwork, image, attitude must have this barbaric, epic feeling and atmosphere that is somehow linked to our identity and personalities. Thus the choices are quite appropriate. I honestly think it suits us very well. If you think all this helps to conjure up images of epic battles it means we have achieved our goals. Maybe the perfect image should be something between Manowar’s front cover of “Into Glory Ride”or the photos of Omen on “Battle Cry”… The music should speak for itself so we try to conciliate both things the best we can. And rightly so! I think your debut album is both honest and passionate, which are two qualities I value. The majority of the songs are of modest length. Only “Ancient Sword Of The Dead” strays over the five-minute mark. I think this is a key strength of your music because all too often epic is equated with long. Is it more important for you to strike for an atmosphere of grandeur? Thank you very much for your kind words. For us, it is much more important to deliver an epic atmosphere than a lengthy song. Actually, we prefer powerful compact songs. We don’t have anything against long songs as long as they aren’t boring. “Ancient Sword Of The Dead” is the longest one on the CD but nothing was planned to turn out that way. We love Metal as fans. We love to compose and play Metal from our hearts even if we’re not such talented musicians or I’m not a good singer or if my lyrics are only for Cro-Magnons. We are not here to compete with any band or are we trying to bring back the ’80s. We just keep faithful to our roots. There is no true or false Metal only Metal. This is very refreshing to hear. To what extent do you think you have achieved this feeling with the first release? I think the lyrics are integral to the development of this theme. Heroism, accomplishment and pride run throughout the songs. But what gives Ironsword a greater sense of identity is their focus on the Roman Empire and how it impinged on their native Portugal. “Under The Flag Of Rome” and “Into The Arena” paint a picture of conquest and slavery. Have you a passion for this period of history? I’m responsible for all the lyrics and always try to make them applicable to our daily lives. Some values from once glorious ancient times are totally forgotten and others scorned nowadays. We have to learn so much from the past to avoid repeating our mistakes and also to better understand where we all come from. That’s my basic message with a strong sense of heroism, courage, rebellion, freedom and pride. All myths and legends have so much in common although there are different characters, scenarios and interpretations. Throughout history civilizations overcame one another taking profit of some trivial aspects of the previous culture. One life cycle ends while another begins. Would I be correct to deduce you are a keen supporter of peoples’ independence? I believe we must fight for independence and freedom. I cannot bare injustice but unfortunately society imposes standards of behaviour and civilization thus the weapons are replaced with bureaucracy. The first album deals more with the Roman invasions of the Iberian Peninsula during the Iron Age but I do not like to limit myself. Over the years I’ve written lyrics on diverse themes including Celtic and Norse Mythology, Shamanism, Cthulhu Myths, Atlantis, Arthurian legends, Ancient Greek civilisations but more about the Romans and pre-Celtic tribes that inhabited the kingdom of Lusitania now known as Portugal. The Roman period is one of my favourites because Portuguese history is richly linked to it. They contributed to its evolution but the process of Romanization was a cost too high to pay in death or slavery. There are several archaeological monuments all over Portugal. The famous disciplined war machine with its greed to conquer the world spread its wings all over Europe Asia and Africa. Would you say you anti-imperial? I’m not. I have to admire my enemy. I’m proud of being Portuguese, of my origins and my country’s pre-Christian history. And I am not a nationalist bigot if you know what I mean. But back to the music itself. Some of the songs are already relatively quite old. Presumably “Call Of Doom”, “Guardians” and “Burning Metal” were the component parts of a demo that was shopped around in ’98? They have a younger feel to these ears. 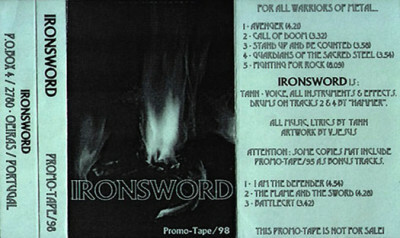 What I would ask then are the compositions that appear first on the disc more representative of Ironsword’s current sound? 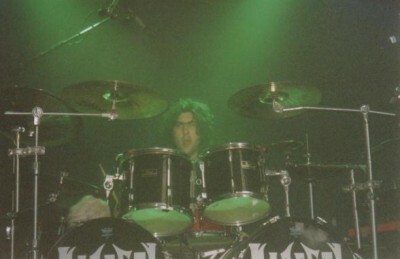 Actually “Burning Metal” was recorded in ’98 but never appeared on the promo tape that was released back then. 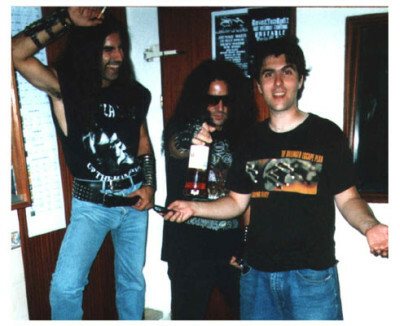 This song was also supposed to be used for a split single with Metalucifer through Iron Pegasus Records but in the end was not. It was a pity but finally it appears on the CD. I honestly think the old songs fit perfectly with the concept of the album. The other songs differ little musically as they were composed 1999/2001. 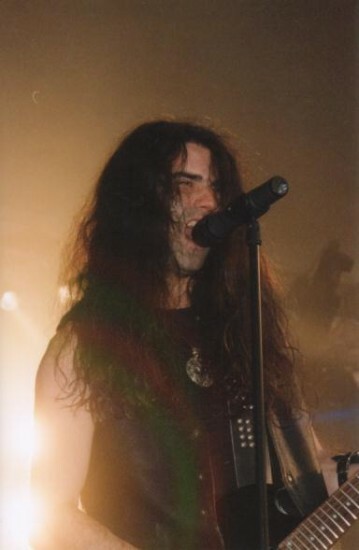 All the songs are representative of Ironsword’s current sound. Maybe the biggest difference is the vocals, which are now more hoarse. How will the new material develop in terms of music and lyrics? If history is a true source of inspiration to you I think it would be interesting to explore incidents and battles that actually took place before and during the waning of Roman power thus building upon your foundations. What say you? In fact I’ve been composing songs since ’95 and some were never released. They will be used on future albums but will sound like they were composed today. We will always reinvent ourselves. Our goal is always to create good quality extraordinary raw epic Metal from the heart and soul. I cannot predict how Ironsword will develop in the future but we’ll avoid trends and always follow the rainbow path of epic Metal music. The same goes for the lyrics. I’ll keep delivering the message of the past, ancient civilizations, their myths, magic and way of life. History is a great source of inspiration and it is funny you mention the Roman Empire as I intend to explore this subject in greater detail. Have you had the opportunity to air your songs in the live arena? I imagine Portugal, like Ireland, has a limited number of venues that would support heavy music and perhaps less of a demand for your particular brand of Metal. That said the summer months in Europe provide a plethora of festival opportunities. Have you approached Gods Of Metal, Wacken or Headbangers Open Air? If a small tour was scheduled would Ireland be a feasible destination? No live gigs yet unfortunately. We decided we would dedicate ourselves to composing our second album. Then we will consider playing live. We are looking forward to a real Metal show but we don’t want to rush things. I want to play everywhere from small clubs to open air festivals as long as we feel a good vibe playing live. Portugal is similar to Ireland. Not too many bands, fanzines, radio shows, gigs, but real supportive people with some trendies mingled in. I guess this is everywhere. There might be a good chance of Ironsword playing Ireland. All we ask for are the basics like food, a place to stay and plane tickets. We aren’t rock stars! I would really like to play there one day because Ireland is my second spiritual homeland. I love its culture. I visited Dublin in ’95 for fifteen days and it was a memorable trip! Our readers would no doubt be intrigued to learn how you came to team up with the Miskatonic Foundation. A small independent label based in the north of England might not be in the ideal location to champion your cause but I can see how Ironsword fit like a glove on the roster. Do you feel the physical base is immaterial as long as the label has the right contacts? After the release of the promo ’98 Rich Walker wrote to me asking for our material. In time, there was a huge interest from him to sign us and of course we signed the deal. He was the only one that showed genuine support and more than 100%! It was not a matter of location because the label could be from Tasmania or wherever. We slowly built a friendship; we share a common Metal bond with similar ideals and tastes. I trust Rich Walker. Maybe that’s why we fit like a glove. You sound satisfied with his efforts. Will you remain with him for your second album? We are totally satisfied. We achieved our goals. We even surpassed some of our expectations. We hope to work with Miskatonic for many, many years. We are not using the label as a transitory phase to sign to a bigger one. If we trust him and are totally satisfied with where we are why bother searching for a bigger label? We feel lucky to have Miskatonic on our side because it is kind of an elitist label that only signs bands it really likes. We are proud to be part of it. Our retribution, if you can call it that, is to make Miskatonic a bigger cult label. No doubt the Yorkshireman will appreciate the sentiment. Not many bands are playing the way Ironsword play so do you have a sense of community with any of your contemporaries either within your label or the world at large? I think the simple straightforward structures of your music resemble Running Wild but the singing does not. How would you portray the overall experience of your band to the uninitiated? Yes, you’re right! Maybe it’s because we are very honest about the music we play. We cannot deny our influences, Manilla Road or Omen…but we put our identity into the music. Even my vocals resemble Mark Shelton meets J.D. Kimball. Most of the bands I know have this polished, clean, almost beautiful sound and this makes them different from us. I’m in contact with several underground bands worldwide even though they have almost nothing to do with the barbaric, epic sound but we are bound by the cause of Metal! 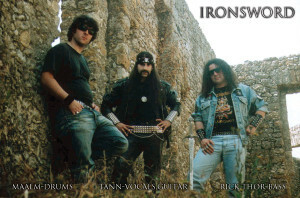 And to all readers that don’t have a clue about Ironsword, I advise then to listen to us if they respect bands that don’t follow trends. Finally, if you called upon your local mystic what do you hope you would hear about the future of Ironsword? Tann, it has been a pleasure. Good luck. I will watch over your continuing campaign of Heavy Metal. All of you should do the same!